Daniele Emilio Franceso aka DJ Face was born in Milan, the son of a discographic editor and grandson of a Jazz musician. From the age of 16 he has lived in contact with the innovative and non-conformist environment of self managed Social Centres, promoting culture and musical styles unknown to media and main stream, like Punk, HC. In the summer of 1994, at a festival of alternative music in Sardinia, where “Mutoid Waste Company” performed, he came into contact with Trance and Electronic music. In the winter of 1995 he started playing them on the frequencies of “Radio Lambro” then renamed ‘Radio Onda d’Urto’, a community independent radio (www.radiondadurto.org), now with an interregional network with a share of 160 thousand listeners. Dj Face created “Brain Splatter – Radio Magazine of Music and digital electronic Culture”, still on air and online to this day, every Friday night with his section of party info and new releases. From there the step to dj sets and parties was short and from 1997 he gave his contribution making raves, collaborating in the first significant experiences in the scene, first in Milan at squats and clubs, then also in Bologna, Turin, Rome and Southern Italy and from 2000 he began collaborations and contributions in France, Slovenia and Switzerland. Now predominantly at the “Leoncavallo” in Milan he has and continues to promote hundreds of djs and Live acts that, with their performances, will massively contribute to create the alternative, trance and electronic Italian scene. 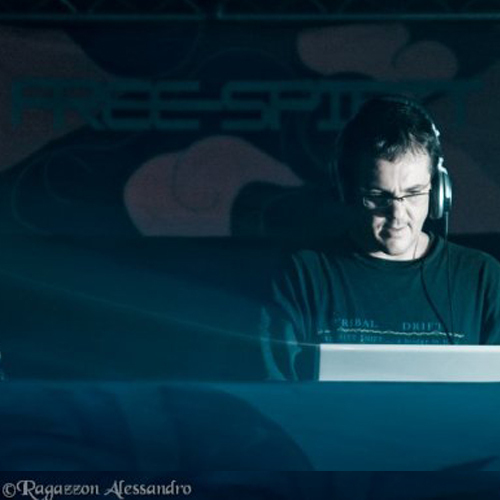 DJ Face joined the Free-Spirit Records team in 2009.